We have a week and a half to go for Etgar and Machon. 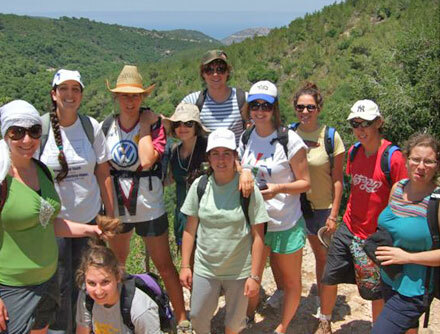 The shnattim are doing fine and looking forward to their next part of Shnat- going to the cities! Machon enjoyed their peer- led week and Etgar enjoyed their Northern Tiyul in the Galilee and the Golan Heights. This week we informed the shnattim that they are all going together to Kibbutz Yahel for their last part of Shnat, starting the 30th of August 2009. We hope they have a great time there. We are all missing you greatly, but are keeping ourselves busy with our daily lives here in Israel. Machon is coming to an end. Some of us are sad to have to leave this place we have called home for the past 4 months, and other cant wait to move onto the next part of our Shnat program. Classes are concluding and this week started our peer-led week. Last Wednesday Machon held a Tikkun Leil for us to celebrate Shavuot a day earlier than the country, so we could have fun learning as well as going out to the commnity for the real shavuot the next night. At 11.45pm we all made our way to Ulam Rachel. We were provided with tea, coffee, fruit, biscuits and of course the traditional cheesecake to keep us awake. We had 4 guest speakers over the course of the night – a feminist, a hareidi, a kabbalist and an environmentalist – who each spoke about two topics including an insiders vew on Hareidi society and Kabbalistic philosophy. The busy night of learning concluded at 5.30am when we headed down to the tayelet to watch the beautiful sunrise over Jerusalem and to sing songs and a few prayers – Netzer style! Thursday was a chofesh day so we could sleep and recover from our night of learning and have an oppotunity to attend another tikkun leil that night. The weekend was a normal free weekend. Most machoniks chose to stay in Jerusalem. I enjoyed shabbat with Etgar. We baked challah and lit shabbat candles that Rikki and Talia had decorated during their volunteering. Rikki cooked up amazing sushi and we had a really enjoyable dinner. Monday was our first day of peer-led classes. This is where fellow machoniks become the teacher and the teacher’s join the rest of the class as students. Our erev peula was a particularly fun night. We went to a park and we had pizza and ice cream for dinner before playing backyard cricket. We were then split into teams where we had to dress up to play a giant board-game drawn out on the basketball court. There were lots of group challanges and we all had a lot of fun. Tuesday was a regular day, except at 11am we had a bomb drill. The sirens went off over the city and everyone made for the bomb shelters. It was an experience i’ve never had before and hope never have to repeat. That afternoon for Tnua time (it was just Machon because Etgar are on tiyul) Neil treated us to a movie, popcorn and drinks. We weren’t told what we were going to see – it was a surprise. We made our way to Malcha Mall, sat in our seats and anxiously waited for the movie to start – meanwhile trying to guess what it was that we were about to watch. It turned out to be Star Trek!!! We all enjoyed ourselves especially as it was the first time for most of us to go to the cinemas in Israel. Sending you all our love and ensuring you that our Hebrew is getting slightly better each day. Dear family and friends,this week started off with a late wakeup on Sunday and then lunch at Dana’s place, where Shira and Dana cooked us a feast of delicious pasta and a choice in salads. Here, we were briefed about the week to come.Bright and early Monday morning, we were up and on the bus, ready for Northern Tiyul. Sadly, we also had to say goodbye to Alex, who was going back to Australia. We picked up our tour guide and friend Niro in Tel Aviv and were on our way, up to the north of Israel. We started the tiyul with a short hike on Carmel Mountain which is also called Little Switzerland. We soon found out that the name originated from how green everything was on the mountain. That afternoon, we had a coffee and a look around the Druze village, Dalyat Al-Carmel and then we were hosted by some people from the Druze community who answered our questions about their religion and also cooked a good dinner, made even better by the fact that we were all starving. Some interesting things we learned about the Druze are that at 15 years of age, everyone has the right to choose whether they will be secular or religious, and also the Druze believe in five prophets. The next day we awoke early, drove to the Kinerret and went to a lookout, where Niro taught us about the significance of the sea, such as it is the source of water for a large percent of Israel. After this, we went on a five hour hike called Wadi El-Al, which was absolutely breath taking, albeit really, really hard.On Wednesday, we had a more relaxing day, visiting the caves at Rosh Hanikra, and then went wine tasting at a place called Binyamina. This week was incredible, but even so, I think we were all happy to see the weekend come a day early! Summer is here, and also the feeling that things are coming to an end- whether it is Etgar, Machon or the whole of Shnat Netzer. Machon had a very interesting, complicated and meaningful trip to Chevron, and Etgar enjoyed their very well organized peer-led week. This week the entire group (both North and South) met on Tuesday in Tel- Aviv for the MASA Mega Event- once a year, MASA holds a special event for all the MASA programs in Israel. This year it was held in Tel- Aviv, and had our Prime- Minister Binyamin Netanyahu coming to bless the participants; awarding the volunteering prizes to participants; a concert by Mosh Ben- Ari. The shnattim enjoyed a Shabbat Beyachad last weekend, and one wrote to me: Thought you might like to see the photos from Shabbat B’yachad – there are some really really lovely group ones that I think you’d like. Have a look here. I hope you love them too. It seems that the group really enjoyed their time together. Our participants are doing well, and enjoying their time. Offers and suggestions as to the upcoming Chag Shavout were given to the Shnattim, and we hope they will use them. So, last Friday we had a shabbat bayachad (together) with all the shnatties on kibbutz Ein Dor. Its was most likely our last chance for the whole group to spend time with each other. We ran a service for the kibbutz and spent lots of time at the pool, not to mention celebrating the birthdays of Kimmi, Sarah, Blake, and Oli! As scheduled, on Sunday, Etgar began their peer led week. We ran amazing programs for each other like politics in the middle east, the amazing race, Kehila (community), and much more. 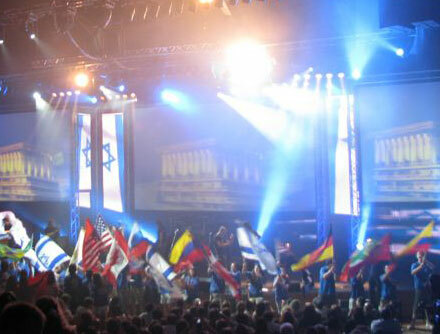 On Tuesday evening, the whole Shnat group was invited to a MASA event, with many performances and a speech from the Israeli Prime Minister, Bibi Natanyahu. We ended our peer led week with smoothies on Wednesday as Thursday is the beginning of Shavuot. What a HOT week!!! The summer suddenly came, bringing a hit wave to Israel, and making it hard to focus. This week is the last regularly scheduled week of Etgar. The Etgarniks had their last week of classes and started saying goodbye to their volunteer places. They have also begun planning the end of Etgar. Most of their energy has been focused on next week’s Peer-Led Week, a week during which the Etgarniks get to plan an entire week’s activities on their own. They have created planning committees and are in the process of finalizing the schedule. Everyone in the group will be leading activities. They have also started planning their Sikkum Seminar. On Wednesday the group went to Mitkan Adam, an army base near Modi’in that house a special unit that works with dogs. We are very fortunate to have Yuval, (a member of the Netzer family who is the current TAMAR coordinator and Netzer liaison to Spanish-speaking countries), who served in this army base, joining us on our trip. Machon came back from a 5 days trip in the North, which was truly great! All the shnattim loved it and described it as one of their best experiences so far. Thursday is Yom Yerushalayim and the shnattim went out to celebrate in the city that they have come to call home. This Shabbat, a few of our Northern shnattim are celebrating their birthday on kibbutz Ein- Dor, and invited over all the shnattim to celebrate with them. About 50 shnattim are expected to celebrate the upcoming birthdays, with Netzer sponsoring the Shabbaton. Mazal tov guys! This weekend was initiated and organized by the Shnatim and we are very proud of them for their initiative. This week on Etgar we had a fairly standard week in terms of classes although we spent large amounts of time planning for peer led week, the week in which we plan and run the entire week of etgar which is next week. Today we had a siyur to an army base where the dog unit of the Israeli army is based, we had a tour and got to see, some of the 300 dogs that are in the unit in action, including dogs sniffing out explosives and weapons and attack dogs ferociously launching and attacking at a trainer in a protective suite. this showed us a whole new innovative element to the IDF and one you certainly don’t get to see every day. We said goodbye and thanked all our teachers this week as this was our last standard week of Etgar, next week is peer led, then northern tiyul and finally sikkum seminar. Our alarms rang at 6:30. By 6:45 we were on our way. As the Pope was driving somewhere that day all roads around Kiryat Moria were closed off at 7:00. Luckily we made it and had a nice sleep until breakfast. On the first day we explored old Acco. We toured the old crusader buildings, the markets and the port. This was the second time I’d been to Acco but this time with Haggai guiding so I learnt all these different facts and more background. As the Hummus is unbelievable in Acco as soon as we were on lunch break, a few of us ran down to Hummus Said and cued up. You get hummus, pitta, onion, pickles, olives and tomatoes. It is unbelievably delicious. I ate one entire bowl of hummus by myself. After Acco we had (extra) lunch on the resort like Achziv beach were we played a bit of beach cricket, swam and read. Our last stop was the Grottos in Rosh Hanikra (naturally formed sea caves) before driving to our hostel in Pi’quien, a druze village. In the evening we had an amazing kef (fun) peula and went to late right before a day of long hiking. We hiked along Nachal Kziv past Montfort Castle through jungle like valleys. In the night we drove to Kibbutz Manara where we stayed for the weekend, literally on the border of Lebanon. There was the kibbutz fence, then the road, then the Lebanese fence. Nearby was a Nepalese-manned UN base. On Friday we toured Mt Meron and Tsfat before preparing for Shabbat. In the evening Shabbat we had a very interesting and potentially controversial service. We wanted to have one Shabbat together, Orthodox Reform and Secular so we created a special service. We had the full Orthodox service plus lots of readings and alternative prayers in the booklet and some poems read out. I ran the service with Josh Back, a lovely hinani-ite. In the hall we set up two mechitsas, men and women on the left and right of them and mixed between the two. Proudly our service fulfilled all the requirements of the most Halachly observant there (which is quite observant). It was very different and strange for some people and was mostly a great service. A few people couldn’t be bothered participating, which was disappointing, but expected. On Saturday we had a relaxing Shabbat and then Saturday night was Karaoke night. Sadly there was no R.E.N.T on the machine. However we discovered there is an amateur production coming. Machon is coming to an end but is extremely busy. Soon options will start!! It will be very sad to leave Jerusalem which feels like such a second home. Again: most people are still planning on coming home. Get a taste of the fun you can have with Netzer, from our report and photographs of the December 2007 camp at Glencairn, near Cape Town.